One of the recent developments in the bulk market is that more and more clients are in need of special and custom-built solutions for a reasonable price. TBMA Europe can rely on 50 years of experience and a wide range of components which can be combined into a custom-built solution such as a repacking installation for big bags to bulk. The installation, developed by TBMA, had to meet requirements such as a high capacity, suitable for different products and high ergonomic and hygienic requirements. The developed big bag installation can handle a large variety of big bags with or without outlet spout. Almost all known big bag sizes and ‘single use’ bags can be processed as well. extracted product into the screw. In this way all the product is processed neatly and there is hardly any waste stream. This installation offers very efficient discharge hoppers to unload big bags filled with difficult products. The hoppers are engineered with steep walls and a vibration motor to ensure that even the most difficult products can easily be unloaded. A flexible membrane with a smaller opening than the diameter of the big bag is mounted at the upper side of the discharge hopper, joining this membrane seamlessly around the big bag when it is being placed in the hopper. Then the bags can securely be opened through the trapdoor in the hopper. ‘Single- use’ bags or bags without outlet spout are opened with a special three-sided knife which cuts a large incision in the bottom. Both hoppers are connected to an integrated filter system. The installation is also equipped with a Moduflex loading chute. Together they ensure that the amount of dust escaping during the opening and emptying of the big bags is being reduced to a minimum. The entire installation is assembled on a framework, according to the ‘plug-and-play’ concept. In this way a forklift can easily move the frame and make room for other handling operations, if needed. Depending on the type of product, this installation can discharge well over 20 big bags per hour. BULK-FLOW was founded by bulk packaging experts, most of them patent holders, that together represent dozens of years of expertise in the bulk packaging field, combined with the market experience to drive specific bulk packaging solutions needed by the industry. The company manufactures container liners, big bags and palletizing adhesive systems. Recently, the company has developed a Mega-FIBC, capable of loading four to eight metric tonnes, depending on the bulk density of the product. BULK-FLOW’s Mega-Sack is ideal for large shipping operations that require a lot of bagging or operations that need significant storage capability without silos. Reduces handling costs by eliminating handling intensive smaller bagging operations. Increases productivity in terms of ability to bag more product per hour. Reduces warehousing costs by decreasing the amount of handling per metric tonne. Easy and economic way to storage large amounts of product. Made of UV-resistant fabric that allows long-term outside storage. Special fabric strength minimizes bulging. Can be fitted with inner liners for humidity and water protection. BULK-FLOW is also developing a new product that is still in the internal testing phase. Mega-Sacks, with size-specific applications, have been developed as well to fit into alternative means of transportation. This is the case of the 4MT Mega-Sack, custom sized and engineered to be transported in rail gondolas. Rail gondolas can be a cost-effective alternative to rail hopper cards that at times become unavailable due to seasonal high demand. 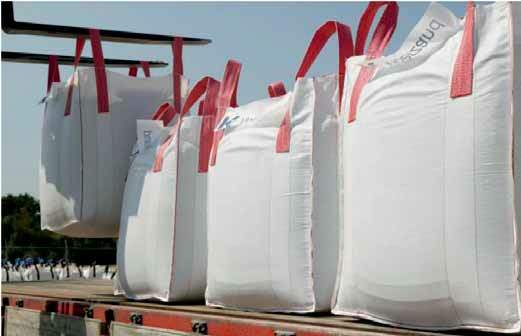 Opens new alternative logistics channels for moving bagged bulk. Custom sized to optimize payload in a rail gondola. STATEC BINDER GmbH, a specialist in packaging and palletizing equipment, is a globally successful and respected partner for flexible solutions in packaging and palletizing of bulk goods of all types, and boasts a long tradition. For more than 35 years the company, with headquarters in Gleisdorf, Austria, near Graz, has successfully implemented its experience in packaging technology worldwide. STATEC BINDER develops, designs and manufactures all of its machinery in its ISO 9001-certified plant in Gleisdorf, Austria. Today, some 1,000 packaging machines have been shipped and successfully installed around the world and to the complete satisfaction of clients. Despite its location inland, STATEC BINDER has always built and shipped packaging machines for all the major ports around the world. And the company used this approach in designing its latest packaging system: a stand-alone mobile packaging unit consisting of two 20-foot containers placed on top of each other. In many of the world’s ports, companies often need a temporary packaging unit when a ship docks in order to package products being unloaded. As a result, the packaging units must function entirely autonomously to ensure that they are available on-call at ports and can be put into operation. For this reason, the packaging unit comprises two 20-foot containers placed one on top of the other. The upper part contains the intake hopper and the two automatic net weighing scales to weigh the product. The lower part contains the filling clamp as well as the outfeed conveyor belt with the bag closing machine. This is typically a sewing machine. In addition, the electrical cabinet and touch panel to operate the system is located here. Additionally, in a separate part of the lower container there is a diesel generator for power supply and a compressor for supplying compressed air. This allows the packaging line to run independently of an existing electrical and compressed air supply. STATEC BINDER has thus created for clients a stand- alone packaging solution that is fast and can be used in any place and at any time without the infrastructure otherwise required. All parts that come into contact with the product are made of stainless steel. All the other steel parts are sandblasted and coated with a primer coating and a top coating suitable for use at ports. The Portopac packaging unit can be equipped with an automatic net weighing scale with gravity dosing, belt dosing or screw dosing and is therefore suitable for all kinds of powder, crystalline and granulated products. After use, the containers can be closed at any time, transported and stored until they are needed again. In addition, the packaging system does not need to be packed specially for transport on land or on the high seas, because it is already made of two containers that are part of the packaging system. Big bags are most commonly made of woven polypropylene. This is a polymer that, like other materials, is damaged by exposure to sunlight over time. This degradation process can ultimately cause the fabric to tear when exposed to strain and put both content and personnel at risk. Through the use of UV stabilizers in the polymer and the proper handling of FIBCs, the risk of photochemical damage can luckily be reduced to a minimum. It is however vital that FIBCs are covered or stored away from the sunlight during usage, transport and storage. Standardized tests to demonstrate the UV resistance of FIBC have been in existence since 1989. The UV resistance test according to Annex A of ISO 21898:2004 is currently the prevailing standard. However, standardized test conditions inevitably vary from the real-life conditions that FIBCs are exposed to during use. Not only does the spectrum and intensity of UV radiation vary in different climate zones, but also other weather impacts like temperature, humidity or frost play a role. Furthermore, substances in contact with the polymer, like pigments and even the goods filled into the FIBC, may also have an influence on the UV stability of the bag. The combination of these factors will altogether influence the speed of photochemical degradation of the polymer fabric of FIBCs in real life. Consequently, voices from the industry are beginning to question how well the laboratory tests set out in ISO 21898:2004 correlate to real-life conditions and can predict the life-time of FIBCs used in different climate zones around the world. Ultraviolet light is harmful to plastics because it attacks the carbon bonds in the chemical structure, releasing free radicals which in turn react with oxygen in the air, destabilizing the plastics’ chemical structure and degrading it. The most obvious mitigator of degradation of FIBCs due to UV radiation and other weather impacts is to physically protect the big bags from the elements. Although FIBC handling instructions routinely advise against outdoor exposure, this is not always practical for users and certainly not controllable by FIBC producers and traders. Chemical alternatives are available and widely used to help polymers like polypropylene maintain their properties longer against degradation through environmental influences. To counter the harmful effects of UV light on FIBC, two main methods are used: UV light absorbers, e.g.Triazine or Benzotriaole, and light stabilizers, i.e. HALS (Hindered Amine Light Stabilizers). These additives, which absorb or stabilize UV light respectively, are often introduced to the base formula for the polypropylene material out of which the FIBC are woven. Both methods can retard the damaging effects of UV light but cannot stop it altogether. Either way, photochemical degradation remains a reality that must be taken into consideration. The question becomes how well we can predict the lifespan of the FIBC given that it will be exposed to environmental stress. This is the job of the testing system. The aim of testing is to recreate environmental strains in a controlled laboratory environment and examine the durability of samples against a battery of tests. In this way, accelerated laboratory UV tests allow quality control on FIBC without performing extended outdoor tests. Ideally, the results confirm the load-bearing capacity of the FIBC upon which decisions on usage of the FIBC are based. ISO 21898:2004. The regulation lays down rules for laboratory tests using UV B lamps (based on ASTM – G154-98). In a cycle that alternatively subjects samples to eight hours of UV light at 60°C at a time and then four hours of condensation at 50°C at a time for at least 200 hours, the weathering strain on FIBC is simulated. Once the exposure is complete, the samples are to be tested for their breaking force and the elongation of the fibre at the breaking point. The results are then compared to a control sample. This caveat in the preamble of Annex A of ISO 21898:2004 hits at a central shortcoming of the accelerated UV resistance test with UV-B lamps at 60° – it does not adequately represent the real outdoor conditions. Therefore we cannot predict how well that correlates to real life exposure to light, temperature and other environmental influences in different climates form the arctic to the tropics where FIBCs are being used. Committed to providing a forum to discuss and inform about known and emerging topics affecting the FIBC community, EFIBCA (European Flexible Intermediate Bulk Container Association) hosted a UV Workshop in October 2014 for its members. A panel of experts spoke to the assembly about the technical, legal and practical aspects of photochemical degradation and weathering. EFIBCA UV Workshop delegates reached consensus that improved life-time estimations of FIBCs are of vital interest for the industry. That would not only help mitigate UV-related risks, but also allow cost savings through better adapted polymer formulations and more specific handling advice. Samadijavan, EFIBCA Vice President for Technical Matters. EFIBCA has therefore formed a UV experts group that will further investigate on the correlation between accelerated laboratory tests and real-life weathering of FIBCs. EFIBCA has been dedicated to promoting end-user safety and the correct handling and use of FIBC since the beginning. Initiatives for the education of end users like the EFIBCA Question and Answers brochure promote the safe and correct use of FIBC. Further, the EFIBCA-Q Quality Pledge puts forward all regulation and quality standards pertinent for FIBC to which subscribers adhere. Quality and Safety Management will be a central theme at the upcoming EFIBCA Open Meeting on 30 September 2015 in Barcelona, Spain. The strong demand for FIBC over the last year as evidenced by the increasing volumes of FIBC imports into the EU, is a trend echoed for many other packaging products across the plastics packaging industry and which many industry experts expect to continue. This positive development on the demand side is under threat, however, due to a raw materials shortage. The industry is currently observing a spate of major raw material suppliers reneging on their contractual obligations towards plastics packaging manufacturers, reports The German Association for Plastics Packaging and films ‘IK’ and many other trade associations in the plastics processing industries. In some cases, confirmed deliveries have to be cancelled by the supplier altogether. When deliveries are made, they are coupled with significant price rises. As internal reserves deplete, this combination of steady demand with an acute and abrupt drop of supply sets the stage for near-term price shocks. The reason for the sudden shortage is a string of force majeure declarations by some of the primary polymer suppliers to the European market. This further aggravates the already stiff regional competition for raw material supplies between Europe, Asia, Africa or Central and South America, putting upward Pressure on prices. Force majeure is a standard yet restrictive clause found in supply contracts which exempts companies from fulfilling their contractual obligations due to irresistible external forces such as an act of God or act of parliament. The force majeure cases registered by raw materials produces in Europe lack detailed information and leave many open questions. The IK association points out that merely claiming the occurrence of ‘incident’ or ‘technical problems’ is generally not sufficient for a force majeure claim. Such causes lie solely within the area of risk of the raw material supplier. Irrespective of the causes for the current volatility of the raw material market, the shortages and sky-rocketing prices put FIBC manufacturers and suppliers under considerable strain. Raw materials can account for 60–70% of costs for these often small and medium-sized businesses. The impact of the unexpected, upward-spiralling price is potentially existence threatening for many companies and will be felt throughout the supply chain. Plastics converters will be left little choice but to pass shortage- driven costs down the customer chain. Founded in 1983, the European Flexible Intermediate Bulk Container Association (EFIBCA) represents the interests of FIBC manufacturers, distributors and material suppliers towards authorities, regulatory bodies, the public and other institutions connected with the FIBC business. EFIBCA offers members a platform for exchange and cooperation on quality, safety and regulatory issues and provides guidance for the FIBC user.